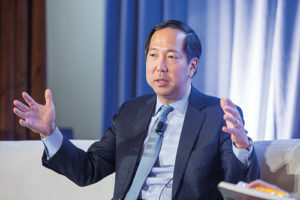 As chief financial officer of the world’s largest alternatives asset manager, Michael Chae knows a thing or two about managing the operations of a complex and growing organization. In January, he shared his insights with delegates at the CFOs & COOs Forum 2019 in New York. Here are the highlights. If you were the CFO of a lower mid-market firm with a limited resources and technology budget, what would you prioritize? People. Attracting talent, and retaining them, and finding them in what I call a hot labor market – which often lags the actual market – is a real challenge. A firm like that obviously won’t have unlimited resources to create an infrastructure, [so] looking at third-party alternatives, outsourcing, is natural. We have a big technology organization, we invest a lot in it. Part of the benefit of our scale is we can do that. But we’re always looking at [whether] it’s a “make” or “buy” decision in some critical areas of applications and processes. We’ve internally developed some solutions that just aren’t available for alternative assets because it’s an immature market.